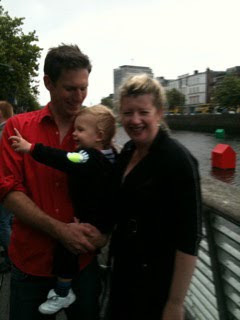 On Monday night we had a party on the boardwalk to officially launch 'Liffeytown'. 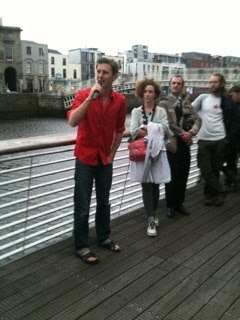 Roise Goan, the director of Absolut Fringe made a speech and I also said a few words. 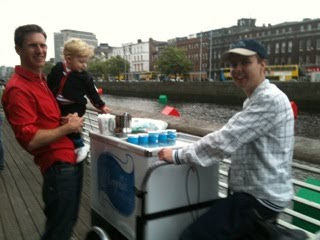 Murphy's icecream sponsored the party with brilliant tubs of raspberry and mint ice-cream. That night all 11 houses lit up successfully about 8pm. Three days later and all 11 houses are still in place and intact. 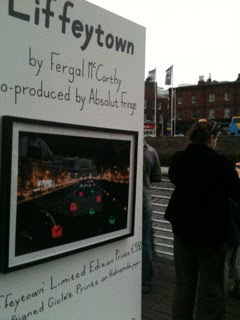 I've been hanging out at the boardwalk every night meeting lots of people who have come in from all over the city to see 'Liffeytown'. I'm thrilled by the positive reaction, long may it last! 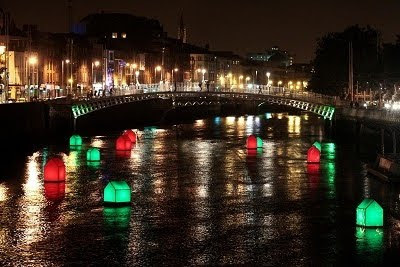 The Irish Times Arts Blog, Pursued By A Bear said, "Liffeytown was always going to provoke debate but it’s a while since I remember an art installation causing such a stir. Well done to Fergal McCarthy for a terrific idea that’s well executed. Here’s hoping his garden sheds last the distance". Also Le Petit Journal ran a piece in their current online edition.